I've teamed up with Dream Scoops to provide my honest review of Cuisinart's ICE-21 1.5 Quart Ice Cream, Frozen Yogurt, and Sorbet Maker. A base with a heavy-duty motor, non-slip rubber feet, and storage space for the power cord. A double insulated, large capacity (1-1/2 quarts) freezer mixing bowl. A BPA-free plastic mixing paddle. An easy-lock transparent lid with a large, easy-to-see pour spout. A simple and easy to use on/off switch. An instruction manual with a large selection of frozen dessert recipes. 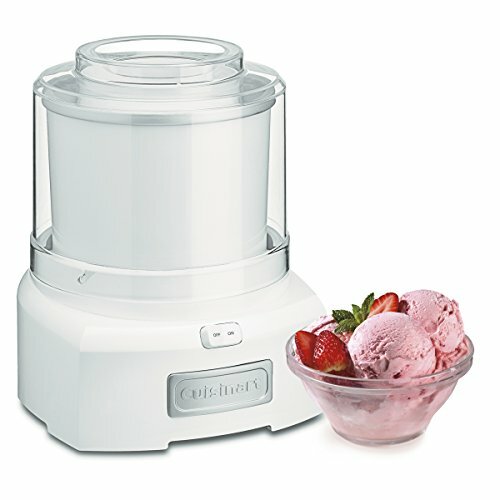 The ability to make ice cream, frozen yogurt, sorbet, sherbet, or frozen drinks in 20 minutes or less. For my first foray into ice cream making land I decided to test Go Dairy Free's Maple Mocha Vegan Ice Cream. I adore her recipes and I knew she wouldn't steer my wrong! Now, tell me this doesn't look good?! When I was first approached by Dream Scoops to review Cuisinart's ICE-21 Ice Cream Maker I just could not be any more excited to give it a whirl. My three-year-old just recently discovered the joy that is ice cream; but in being a moderately health-conscious family, I was greatly inspired by the idea of having more control over just what ingredients we're ingesting in our frozen treat indulgences. The result? An immense amount of fun! As I was mixing my first test batch (see above for recipe), I was admittedly nervous about it actually turning into ice cream! I felt like a kid in disbelief that it could be just that easy (and magical). I was happily proven wrong. I simply mixed up my chosen ice cream recipe, left it to chill in the fridge for 2 hours, pulled out the freezer bowl (I left it in the freezer for 48 hours prior), placed it on the base followed by the paddle & lid, flipped the simple "on" switch, poured in my chilled ingredients, and voilà -- beautiful, rich, thick, creamy ice cream in 15 minutes flat. It was really quite amazing! I could not help but wonder what took me so long to discover such an amazing and easy thing as Cuisinart's ICE-21 ice cream maker. And, I could not be more grateful to Dream Scoops for being the one to introduce me to such magic. Overall, this wonderful kitchen appliance was ridiculously easy to use and went above & beyond in the results it produced. I will be using it again and again; and I look forward to sharing any future frozen creations with you!